After my visit to the Museum Volkenkunde for the Cool Japan exhibit, I went to have to a late sushi lunch at Yuniku, just to stay in the Japan vibe. Before, I only had experience with the AYCE sushi restaurants, Sumo and Shabu Shabu, so I didn't know if the newly opened Yuniku was good or not. But they currently have a special summer deal and the AYCE lunch is only €16.80 per person, so I gave it a try. Food - The sushi were relatively good for an all-you-can-eat sushi place, as I saw sushi chefs freshly make them in the open kitchen area. The fish tasted quite fresh - except for the tuna - and the Japanese rice was chewy, on temperature, and nicely seasoned. Like most of the all-you-can-eat sushi places, the sauces on the grilled dishes aren't so good and/or the same, but the beef dishes were okay. Of the fried food, I like the tempura shrimp the most. The grilled mackerel was nice too. The food isn't excellent, but okay for the price that you are paying. Service - The waiters were friendly and they slowly placed the dishes on our table with sometimes, a short explanation of what it is. After two rounds, the waiters seem to disappear and you really needed to go call them to your table to hand in the filled forms. But they warmly welcomed us in and said goodbye, when we left. Ambiance - We had a large four person table for the three of us with a comfortable leather bench on one side. There was a beautiful sakura tree in the middle of the restaurant and many colorful orchid plants as decorations. It was relatively spacious with some space between the tables. I really loved the beautiful, theatrical staircase (Rose from Titanic moment, when I walked down) and the toilets were clean. Location - Very close to the Leiden Central station and the Museum Volkenkunde, so a convenient place to start or end your day in Leiden. 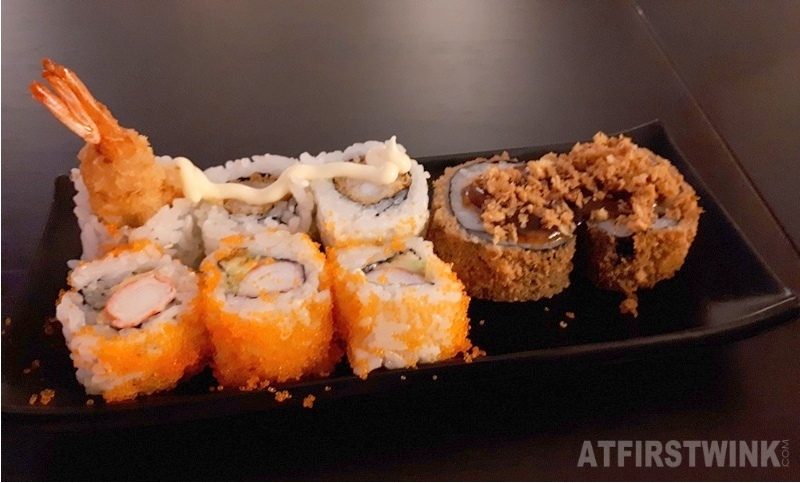 Compared to another AYCE sushi place - It isn't as good as Sumo in their good, early days, but a bit better than the Sumo Rotterdam that I visited this year. I didn't go to Shabu Shabu lately, so I cannot really compare them.